So, I'm on my way to an interview today to develop a new freelancing relationship with a marketing firm. I took a route I was unfamiliar with. Making good time. Then, a white van pulls in front of me, slows me down to 25 mph. I get frustrated. Seconds later, we pass by a hiding cop car that immediately pulls over the man driving a ways behind me. 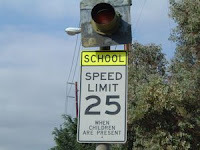 We were in a school zone, unbeknownst to me. Without the white van, I would have surely been pulled over. Possibly late. Certainly frustrated for an interview that went quite well. Divine interaction or sleigh track logic? Certainly the car behind me couldn't give God credit, could they? It makes me wonder if I've ever gotten a ticket so that someone else could make it somewhere on time. Totally divine interaction - and you deserved it! It's like that time your mom got saved by an angel...it runs in the family....however it could have been an angel or kidnappers in the white van - we'll never know. This is a link to the story Heidi's referring to, for those who are curious. When something like this happens its "oh man someone up there must be watching out for me. If you had been pulled over it would have been "Well I deserved that! Man is depraved and this is the result." Where are all the 2nd World Countries? Sweat Shop or No Shop? Is Peanut Butter a Liquid?